George Big Money Guess Jr., son of Sequoyah, was known by a variety of English names. According to the Eastern Cherokee applications of his grandchildren, he was called George Guess, Sequoyah Guess, and Big Money. Additional research provided yet another name for him - Big Dollar. That same research also provided the name of his wife - Tianna. While the spelling varied from document to document, like Big Dollar's Cherokee name, Tianna's name, too, was almost always phonetically the same, despite the spelling variances. Not much is known about Tianna's ancestry, but according to one document, a claim filed about the time of the Trail of Tears, she was the step daughter of Knight Killer. 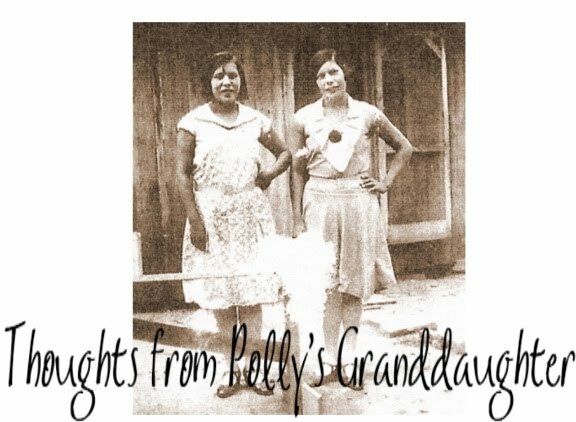 Nellie, her mother (and wife of Knight Killer), was a sister to Nancy, the wife of Rev. John Spirit Huss (his second wife with the name Nancy.) Records indicated that Tianna always lived in close proximity to her mother and extended family. Big Dollar and Tianna lived in Wills Valley in what is now the state of Alabama. While not found on the 1835 census of the Cherokee Nation, Big Dollar's name was listed on the resolution of the National Council that was held at Red Clay on October 24, 1835. That same year, he and Tianna had household goods and farm tools stolen by a U.S. citizen. Tianna filed a claim for their lost property and Knight Killer was the witness for that claim. Sometime between October and November 1836, Big Dollar's improvements were valuated by Rice and McCoy. He was described as an Indian with a family of eight that would remove in the fall. His family was listed immediately after Tesee Guess, his brother, who was also notated as planning to remove in the fall. Sometime during the year that followed the valuation, Big Dollar died. 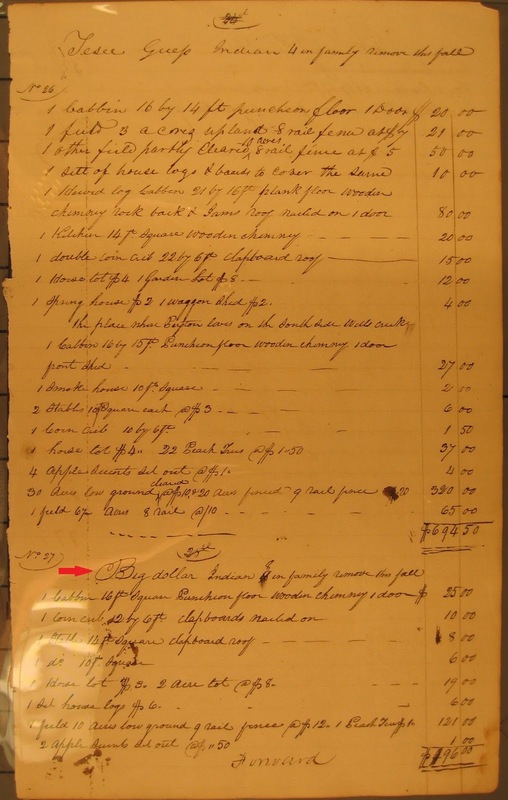 In 1837 and 1839, Tianna received two payments, one for the spoliation claim on household goods and the other for her late husband's improvements. Her name was recorded respectively as Tianna Big Dollar and Tianah (Wife of Big Dollar Gass). November 11, 1837, Tianna voluntarily removed to the west with several of her extended family members. Rev. John Spirit Huss led the detachment which included Tesee Guess and Knight Killer (nine in family). Tianna was listed on the detachment muster roll as Widow Big Dollar; family of 6; with 2 males 10 and under; 2 females 10 and under; one male 11-25; and one female 26-50. 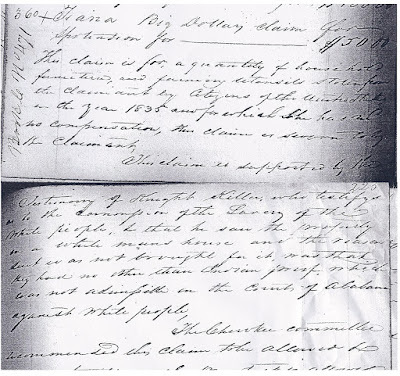 It's probable that the family group listed for Tianna included her four known children, Robert, William, Moses and Nancy. In 1907, Peter Woodall testified that Robert "Bob" Big Dollar Guess was 25 in 1851. That would put Robert's birth year about 1826. If correct, that would have made him 11 years old in 1837. That would indicate the other three children, plus an unidentified female, would have all been ten years old or younger. In the first quarter of 1838, Tianna, received a transportation and subsistence payment under the name of "Widow - Big Dollars." She received another in the first quarter of 1839 under the name "Widow Big Dollar." Tianna was not found on any ration lists in the west from 1838-1840. Knight Killer, her step father, was found on one list from Beattie's Depot, the area where the family settled, in 1840. He collected rations for 15. When Knight Killer removed from the old nation, his family only included nine people. Tianna's family included six. Combined households would have totaled fifteen, so while it is possible that Tianna and her children were living in Knight Killer's household, there is not enough information available to conclusively determine that. 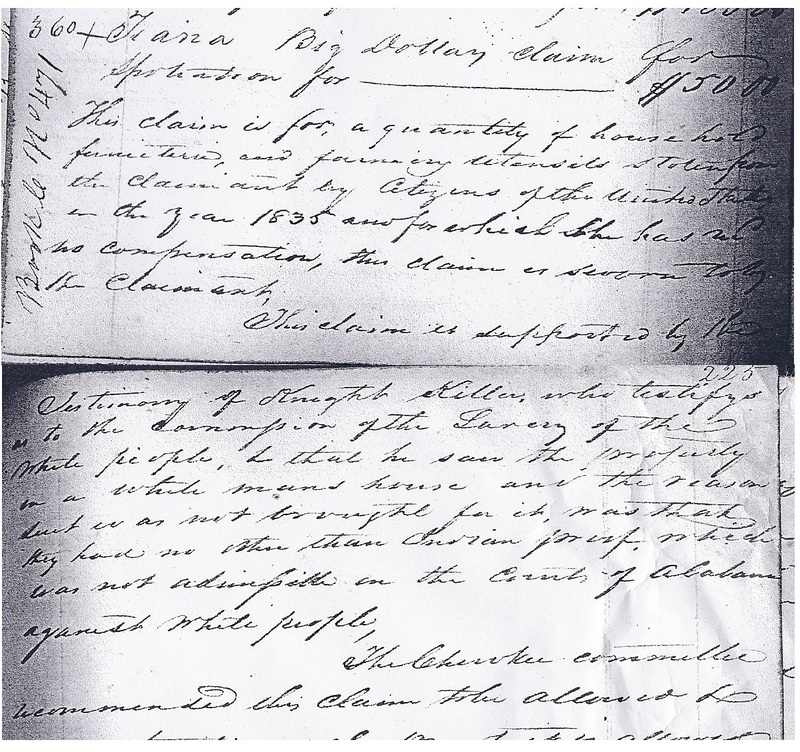 In 1842, Tianna filed another claim for lost property in the east. Knight Killer was again the witness for her claim. 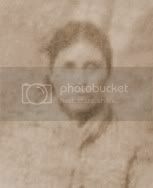 Sometime between her filing the claim in 1842 and the enumeration for the Drennen Roll in 1851, Tianna died. Each of her four known children were listed individually on the Drennen Roll. Nancy was listed as an orphan and directly under the listing for the family of Rev. John Huss. Huss was the signatory for Nancy, so she may have been living in his household. Additionally, there was another girl, Ellen Guess, listed on the Drennen Roll as an orphan. She was listed immediately after Knight Killer's household and Caty Knight Killer was the signatory. It's possible Ellen was the daughter of Big Dollar and Tianna, but without more information, it is impossible to determine it with any degree of certainty. What we do know is that Big Dollar (aka George Guess Jr.) had a wife named Tianna and together, they were the parents of at least four children who reached the age of maturity and went on to have families of their own. Despite Starr's genealogies and despite what some other "researchers" have said, George Guess Jr., the son of Sequoyah, had children and he has living descendants today. Hopefully, they will never be "forgotten" again. Stay tuned for more on the descendants of George Guess Jr/Big Dollar. We aren't finished with this yet. *Note - there were two men named Big Dollar prior to the Trail of Tears. One lived in Tennessee. He is not the same man as George Big Dollar Guess Jr.